Former President Jimmy Carter paid tribute Wednesday night to the late Rev. Theodore Hesburgh, who headed Notre Dame for 35 years. SOUTH BEND, Ind. 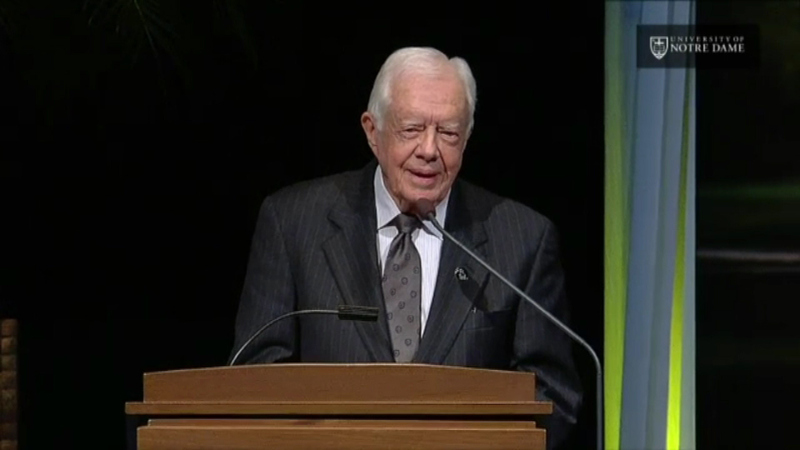 (WLS) -- Former President Jimmy Carter paid tribute Wednesday night to the late Rev. Theodore Hesburgh, who headed Notre Dame for 35 years. President Carter remembered the man he called "Father Ted" as a wonderful man and informal adviser. Hesburgh was known for championing civil rights and diplomacy around the globe as he built Notre Dame into an academic powerhouse. He retired in 1987 and died Thursday at the age of 97.